2 PM EDT Update: The 3.88" a day earlier (July 10) at Roanoke smashed the daily record of 2.67" in 1931. It was also a new all-time July daily record in a climate history which began over a century ago in 1912. Daily amounts of 3" or more had been observed only twice before in July at Roanoke. The 1.84" at Richmond also broke a July 10 record of 1.36" set just last year. To the north, the 2.44" at Pittsburgh beat the daily record of 1.81" in 1958. 10 AM EDT Update: The preliminary July 11 record daily total rainfall for Dulles is 3.71". The 24-hour total ending at 8 am is 4.49", with some light rain continuing. 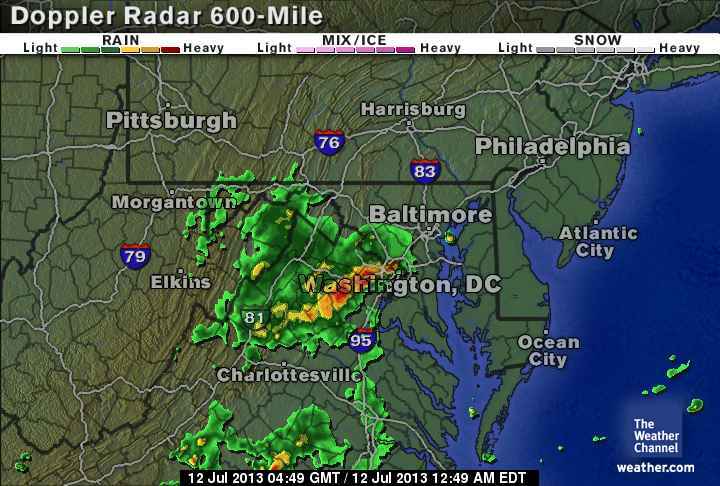 2 AM EDT Update: Dulles has added 0.22" from lighter thundershowers in the past hour for a storm total so far of 3.79". The reported month-to-date total is now 370% of normal. 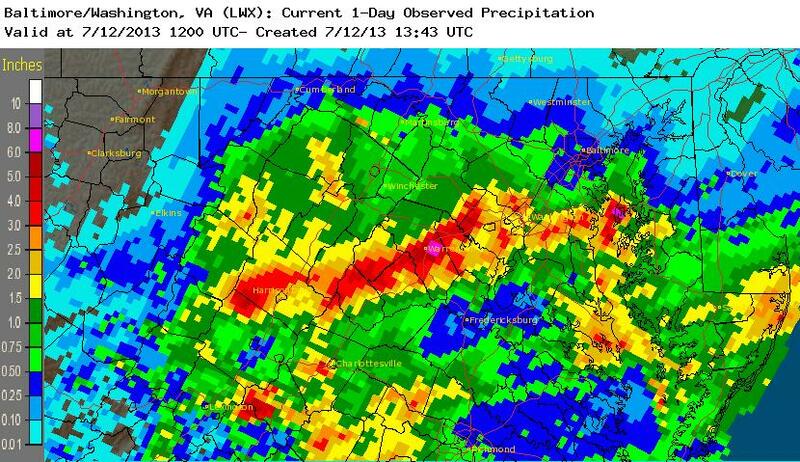 Persistent thunderstorms Thursday evening have produced record rainfall in the Virginia suburbs of Washington, DC. 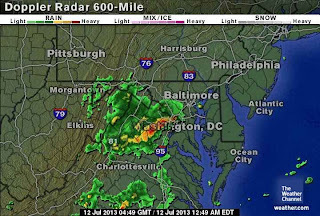 At Dulles Airport, the unofficial total of 3.61" through midnight (standard time) was over 3 times the old record for July 11 of 1.12" in 1977. Climate records at Dulles date back only a half-century to 1962, but this was also enough to beat the all-time July daily record of 3.50" on July 27, 1994.